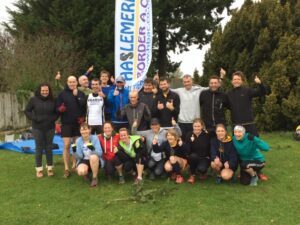 Haslemere Border AC compete in the Southern Cross Country League. The League, previously known as the Hampshire Division of the Todays Runner Winter League, has 23 running clubs who compete in 6-7 multi-terrain events held between October and March. There are some 300 runners at each race and a team comprises 5 men and 3 women. In recent years HBAC have hosted the final race of the series, including this year on Sunday 25 February at Polecat Valley. The race HQ is at The Royal School, Farnham Lane, Haslemere, Surrey. GU26 1HQ.